Link ABYSS Launching This November! I’ve been working hard at putting the finishing touches on Link ABYSS and I must say, the system is looking AWSOME! Development of the site will hopefully be complete by the end of next week and I’ve managed to add some fantastic new features which make it out of this world. The main one being automated link placement which means the system will place the links for you. Allows you to obtain pure one way backlinks from a wide variety of websites including blogs, traditional websites etc across a diverse range of C-Class IP’s. Allows you to obtain various types of links including links from links pages, site wide links, contextual links etc. Allows you to choose which sites to get links from and which sites you wish to link out to (from your outbound sites), on a site by site basis! It has a full built in messaging system. Allows you to add, activate and de-activate ANY of your sites. Allows you to search for websites to get links from using keywords as well as various other means. All websites within the system will have the ability to AUTOMATICALLY populate ALL the backlinks. Full link verification built into the admin so you can instantly verify whether your links are present on ALL the websites. Full statistics on absolutely everything including the number of pending and live links for ALL sites including your own. An unlimited number of potential backlinks pointing to ALL your money making websites, with new sites being added everyday. Allows you to get deep links to your websites inner pages. Allows you to receive email notifications when an action is required by you. This can be activated or de-activated at any time. Allows you to add as MANY sites to the network as you wish. The more the better! This system is truly mind blowing as it ALLOWS you full control over who you link to and who links to you. All the links are pure one ways links so the power this system will have when it comes to BOOSTING your rankings will be unbelieveable. The system will be going into beta test in about a weeks time if all goes to plan and will then be open to new members in November when it goes live. I will be offering the first 500 members a super low price. This will be on a first come first served basis, so if you are wanting to get in then you’ll need to be quick. Once those first 500 places go the price will go up. Details on pricing will be available shortly. Your Link Abyss sounds great. Can I have some details on how its working? Also, do you think we can make across-promotion or arrange on a business deal. Check my pre-launch offering in the link. I can’t wait for this to launch. As a newbie to the power of linkbuilding, I’m only just realising how much I’ve missed already. Luckily, this will help me not only make up the ground I’ve missed, but totally storm ahead of my competition. I have been building links to my site one at a time. I hope this will save lots of time. I’ll be keeping my eyes peel for your email about the launch. Is it backlinks from Link Abyss websites network or from any site on the web? When you join Link ABYSS you basically add two kinds of sites to your account. One set is your ‘money sites’ which are sites that you want to get lots of backlinks for. The second set is ‘link out sites’ which are other sites or blogs that you may have that you will use to link to other members sites. Everytime you link out to another site in the system you will receive a one way link back from another members ‘link out site’ (you choose which one). No money sites will ever link out to any other site in the system, only link out sites. This link building strategy appears awesome. 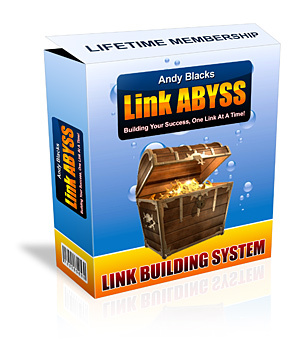 I am looking forward to the leverage my money sites will get from link ABYSS. So, my money sites would never have one of big HUGE footprints like a php page saying..here’s other sites I’m linking to..? That sounds really great! The money sites are untouched and just receiving links while your donor blogs are doing the heavy lifting. So if for some reason your donor blog gets the axe then your money site is always safe. I really like this approach and I’m assuming that I got it right! I’ve recently taken all of my sites out of any 3 way linking systems for fear that they would get drop kicked for trying to game the search engines- so this method looks pretty promising. How would the links be sent out I wonder..in little posts like Linkvana, articles, or straight up links..? I hope that there also would be a pattern easy to detect like 3 or 4 way linking systems out there..? thanks Andy and I hope to see this thing go live soon!